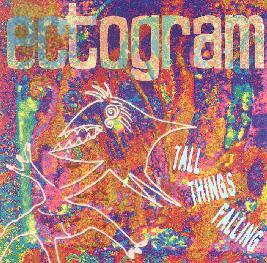 Ectogram - "Tall Things Falling"
This is the third release by this Welsh outfit and is an interesting mixture of psychedelic rock music, from the at times quite hard to the very laid back, but always centered around some odd guitar sounds and effects. The bio says that most of the basic tracks are laid down live as improvisations between the three members and then the extras added. The female vocals are mostly of the dreamy nature. Sonic Youth probably gets mentioned in nearly every review of this group but I only really see the comparison in the way the band uses the odd sounds adding to the psychedelic rock format. This band is more psychdelic and less noise. Clearly this group likes to just get together and make some pretty noisy spaced out stuff and this is just fine with me. There are a few more straight songs like "The Horse Behind The Flower" and "Apparatus On My Mind", but don't get me wrong, these are still not at all ordinary. A very cool psychedelic rock experience. For more information you can visit the Ectogram web site at: http://www.ectogram.co.uk. Tall Things Falling is distributed by Ankstmusik Records. You can visit their web site at: http://www.ankst.co.uk. Contact via snail mail c/o Ankstmusik Records; The Old Police Station; The Square; Pentraeth; Ynys Mon LL75 8AZ; UK.